The Italian Grand Prix could have gone to either Montoya or to Rubens Barrichello and that was its point of interest. The regular stars looked very second-rate all weekend and no-one was quite sure why. Certainly the events in New York and Washington had thrown a lot of people off balance. Even in the cynical world of F1 it was hard to take in the scale of the destruction. But did this explain why the two Schumacher Brothers and Mika Hakkinen looked so uninspired. The Schumachers did not appear to want to be at Monza at all and on Sunday Michael tried to organise that the drivers would not overtake one another in the first two chicanes. It was an odd thing to do for a racing driver famous for his tigerish drives and his uncompromising attitudes. Could it be that Michael is getting old and beginning to mellow? He is getting to that age. But that did not really make sense because a few minutes later he went wheel-to-wheel with his brother going through the high-speed Lesmo corners and came out ahead. So it was not that. Perhaps it was because he is already the World Champion this year. Perhaps it was because of Alex Zanardi's crash at Lausitzring on Saturday. Who knows? The most obvious explanation was that it was a combination of all these things. Michael just wanted to go home. Ralf seemed to be much the same and he never looked like beating Montoya. At least Hakkinen had a good reason not to perform well. His Formula 1 career is over. It may not say that in the press releases but it is hard to imagine that Mika will take a year sabbatical and then come back to McLaren. Kimi Raikkonen has been signed on a five-year deal with the team and David Coulthard is lining up to be the team leader We will have to see how things develop but Hakkinen looked on Sunday like a man who is not really planning to come back. He is still quick in qualifying but in the race he drove like a man who does not want to be racing. And so it was left to Montoya and Barrichello to supply the fireworks. And this they did Montoya was on pole, Barrichello was second and in the race they chose different strategies: Barrichello went for a two-stop race; Montoya went for a one-stopper. And it could have gone either way. It is hard to say. Montoya led early on but then Barrichello overtook him and pulled quickly away. He had a much lighter fuel load. In 10 laps he built up a lead of 10 seconds and then he dived for the pits. There was a problem with the refuelling rig and six or seven precious seconds were lost in the pitlane. If that had not happened he would have been ahead of Montoya. But they would have been close. Rubens would have been on new tires but Montoya would have had a lighter fuel load. So it could have gone either way. As it was in the laps that followed, the gap between the two men went from 23.4 seconds on lap 20 to 25.8 seconds on lap 27. It was not a massive leap but then Montoya by then knew that he did not have to worry too much and he was struggling a bit with oversteer. At the pit stop he had the front wing tweaked by the mechanics and that meant that at the end of the race he had way too much understeer. When all is said and analysed there is no way we can tell who would have won if everything had been perfect. 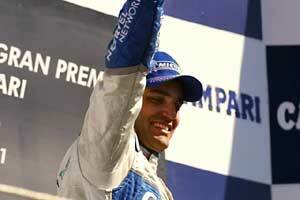 And it doesn't really matter either because the record books show all we need to know: Montoya won. "Considering it's my first year I wasn't really expecting to win," he said. "I had a couple of opportunities where I could have won it and I just said: "When the time is meant to come it will come." So Barrichello settled for second place and was disappointed with that. "I had a weekend when I performed really well," he said. "It was one of my best weekends. I could go for it in qualifying, I could go for it in the race and the team have helped quite a good amount. I think to beat the Williams today it was definitely the right strategy, I think Ross Brawn was magic in thinking of that and giving us an opportunity to fight." Michael Schumacher ended up fourth - which is rare thing indeed - and his post-race comments were short and not very sweet. "I am glad this weekend is over. The most important thing is that nothing bad happened this afternoon." And this was the strange thing. Michael tried to organise the drivers to go slowly at the start. Jacques Villeneuve refused to play the game and the plan crumbled as a result. What did it all mean? Was it the memories of what happened here 12 months ago when a marshal was killed? Monza was passed as safe by the FIA safety team - serious people one and all - and it was odd that Michael did not start on about safety until Sunday morning. On Sunday night the press office resounded with theories: does Michael think of himself as a United Nations ambassador who is bigger than the sport that made him? Did the events in New York burst into the lives of people who are not used to dealing with the real world, living as they do in glistening castles in rarified atmospheres. In the end no-one really knows. It was just odd. Perhaps the whole thing is best summed up by Barrichello. "This weekend has been very dark, not only for what happened in the US but what happened to Zanardi yesterday," he said. "I couldn't stop thinking about him." He also mentioned the crash last year. Ralf too just wanted to go home. Behind these four there was not much left. McLaren went boom. David Coulthard was gone in a cloud of smoke on the seventh lap. Hakkinen did not look very committed at the first corner (and drove across the first chicane to avoid hitting anyone). This dropped him from seventh on the grid to 13th place and he never really recovered. He did 20 laps and then the car lost all its gears. It was dire. McLaren are going to need to do something if the team is to hold off the current BMW Williams charge for second place in the Constructors' Championship. The gap is now down to eight points and one must remember that Williams screwed up big time in Belgium. Ron Dennis will have to ruminate on all this in the days ahead. The demise of McLaren meant that fifth place went to Jaguar Racing and (inevitably these days) it was not team leader Eddie Irvine showing the way but rather Pedro de la Rosa. Irvine qualified three places behind de la Rosa but made a good start to be right behind Pedro but then he began to lose horsepower and slipped away down the field until he retired on lap 14. "It's been a bad weekend for me from the minute I arrived in Monza," he said. The final point went to the bad guy. Jacques Villeneuve who refused to play ball with the other drivers. In the race he was pretty quick but the pit stop went a bit wrong and so Jacques had to race with one eye on the metaphoric fuel gauge. Olivier Panis made little impression all afternoon and finished ninth. A point is still a point and it means that BAR has clawed its way ahead of Jordan in the battle to be top dog Honda - and that is not meant to be a comment of the performance of the engines. It was another poor day for the Honda teams with Jarno Trulli, who had done a good job to qualify fifth, being punted off at the first corner by a rather over-enthusiastic Jenson Button - his future team-mate. Jean Alesi looked good, racing like a trooper as he always does. But having qualified 16th there was a lot of trooping to be done. He was ninth at the end of the first lap and was sixth by lap 12. He was fifth when he pitted on lap 22 and he dropped back to seventh but during his second stint he flat-spotted a tire massively at one point and so had to pit earlier than he wanted to do, worried that the tire might even go bang and so he lost out and ended up eighth. Seventh thus went to Kimi Raikkonen who looked to be on for points early on but an early pitstop (with a one-stop staretgy) left him stuck behind a bunch of cars and so he lost out and could only crawl back up to seventh. Nick Heidfeld had even less to write home about. He lost hydraulic pressure on the grid and so had to go to the spare and start from the pitlane. He finished 11th as a result. Between Alesi and Heidfeld at the finish was Fisichella who had also started from the pits because of a fuel leak on his car. He then had traction-control trouble and had to struggle through the race. "I did my best in the circumstances," he said. The only Prost to finish belonged to debutant Tomas Enge. His was a good effort to make it home in 12th place. "I learned a lot," he said. "All this is new to me but I managed to complete this Grand Prix without making a mistake. I am delighted." Heinz-Harald Frentzen had a bad first lap and lost a lot of places and so found himself 15th (from 12th on the grid). He retired on lap 29 when the gearbox failed while he was running ninth. Minardi managed to get Alonso home in 13th place but debutant Alex Yoong had a rather more exciting race. He had a hair-raising spin in the Lesmos on lap 16 and then did it again with eight laps to go and this time retired. Arrows ran light fuel loads as always and so made an impression early on with Jos Verstappen going from 19th on the grid to fifth in the course of seven laps. But then, of course, he had to stop early and that sent him tumbling all the way back to 15th. He was in the process of doing it all over again when his engine stopped working. Enrique Bernoldi went for a one-stop strategy (which must have been marginal) and was running around in 13th when his engine stopped as well. But, as everyone said, it was good that nothing bad had happened. There had been enough of that in the days before the race.